Someone told me recently (while I was wearing a top from Talbots) that I couldn’t wear Talbots yet, I had to save that for when I was older. I replied that I had to start on Talbots now because I needed to have time for my LL Bean days. 🙂 But in reality, I’m already wearing LL Bean. In fact, I have one of their sweaters on right now, and one of the things I’m most excited about my move from Nashville to Michigan is that I can put aside the trendy sundresses for some way more practical winter coats. My mom’s LL Bean boots are already in my front closet, just waiting. But back to dance, I am hoping in my new town to find an adult tap class to start again. And this time, I won’t be out of place. Want to win a great book about a dance class? Just comment below. Tell me about a dance class experience, or if you, too, are an old soul or maybe you are young at heart. Or just leave your name. Good luck! Thanks for playing everyone! 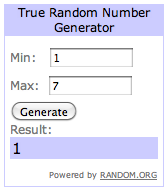 Come back every week for more books to win! And don’t forget to comment below to enter this week! Did you have a best friend growing up? Someone with which you could waste hundreds of glorious hours? 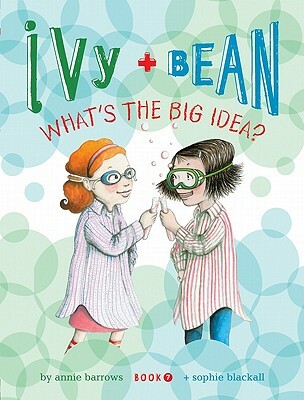 If so, they you will certainly relate to the wonderful Ivy and Bean from this best-selling series. If you haven’t met them, here’s a good intro from the Ivy and Bean website: “The moment they saw each other, Bean and Ivy knew they wouldn’t be friends.” You can guess how that turns out! Ivy and Bean books are great for early readers, especially girls, and fun for parents to read, too, either as a read-aloud, or just to get some info so you can talk with your kids about them. When your daughter slips the bookmark in her copy and goes to turn off the light, you could snuggle up next to her and talk about your own childhood friends. Did you do anything like Ivy and Bean? Does your daughter have a best friend? Ask her if they ever do anything like Ivy and Bean. I always find bedtime is the best time for confidence-inducing conversations. These books are great for me right now because we just moved to a new house. The Wizard of Why is nervous about making new friends. He’s still at an age where he doesn’t mind if the books are about girls or boys, and I can’t wait to unpack my copy of Ivy and Bean and read it to him. He’s going to love the story. Of course, the prime audience for these books are early readers, and probably girl early readers at that, but there’s no rule that says you have to stick to that! Because the Ivy and Bean series starts out with two neighborhood girls who meet, it’s great for families who are moving. One thing I’ve done with my son is talk to him about how I will be making new friends too. This week we tried out a new playgroup (our first one actually; I’ve never done one before) and I told him how he might find some new kid friends and I might find some new mom friends. And judging by the way he was rolling around in the grass in a middle of a pile of four-year-old boys while I gabbed on about working and staying at home, I think we both did. Of course, we can overload our little ones if we tell them too much–they need to know that we are the rock, that we are always there. But we can also model for them, show them that we also have things to deal with in life–like making new friends–and show them how it isn’t scary, but something exciting, and that most importantly, it is something with a solution. Reading and discussing books are often a great way to do that. I’ve blogged about Ivy and Bean before, in this post here, and I will be doing so again (a lot!) as we count down to the release of the next book in their series. What is an Ivy and Bean Blog-a-Bration? 2) On the last week (week 9), which will be in early October, one winner from all the previous winners on all the blogs participating will will an awesome prize package that includes a complete set of the hardcover books, Ivy and Bean paper dolls, an Ivy and Bean button factory, a poster, Ivy and Bean Silly Bandz (yes! we are THAT cool! ), Ivy and Bean stickers, and a super-secret prize that is, apparently, still in the works (which may be why it’s super-secret?). On the right is a picture of all that awesomeness. So, enter away! Leave a comment HERE (or at another location where this blog is posted) BEFORE MONDAY, AUGUST 20th, at midnight Eastern time and tell me one thing about your best friend growing up. Or, if you’d rather not, just tell me your name and a way to contact you. 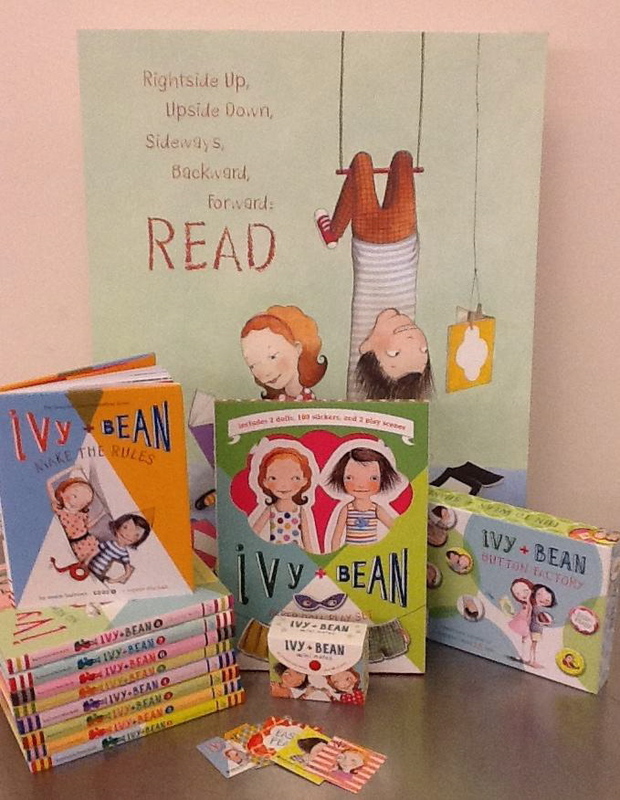 And come back next week for another Ivy and Bean giveaway! If you want to know all the rules and how I will pick the winner, please read this. And if you can’t wait to win a contest, you can find the books at your local indie book store here.